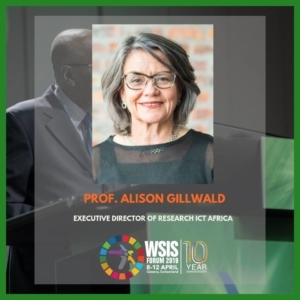 Presented 9 April 2019 at the WSIS Forum of 2019 opening statement. Your excellencies, honorable Ministers Secretary General Mr Zhao, esteemed panel members and delegates and the WSIS Forum organisers, – thank you for invitation to join the high level panel discussions: it is a honour to do so on behalf of civil society and academia. The truth is that despite the valiant efforts of various agencies within the UN System, including the ITU, we don’t really have the data in developing countries to determine where we are now, or to know what progress we are making towards overcoming the ‘digital divide’ reflected in the ICT targets underpinning many of the UN General Assembly’s Sustainable Development Goals. This is particularly so in our predominantly prepaid mobile markets where the supply side data we are dependent on can only tell us how many active SIM cards there are in a country, creating the inflated indicators we receive from operators. It cannot tell us how many unique subscribers there are in country, whether they are men or women, what their incomes are, what they are able to use their connectivity for. 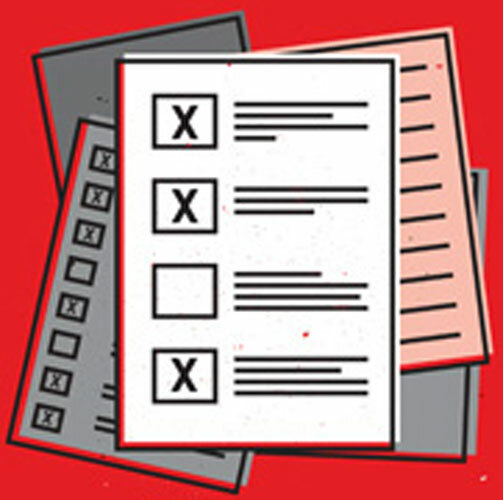 Critically, we don’t have the information from those not connected or have their reasons for not being so – all information essential for evidence-based policyand planning. We are also grappling with the rapidly changing nature of information and communication technologies in this dynamic and increasing complex and adaptive, globalised communication system, all incompatible with measurement and monitoring. What we do know from the evidence available is that we have to move beyond the connectivity discourse that assumes that simply by expanding networks we are addressing the digital divide. 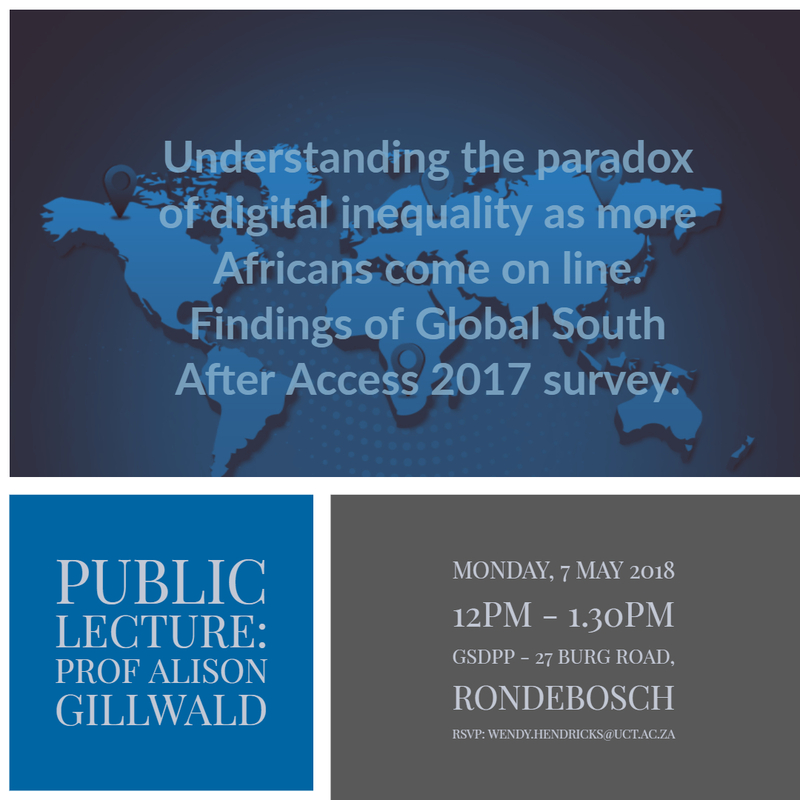 In fact, paradoxically, as more people are connected, digital inequality is increasing. This is not only the case between those online and those offline, but between those who have the resources to use the Internet optimally and those barely online – between those passively consuming a fraction of the apps and services on offer – and those with the resources – financial and human – to put the technology to productive use – not only for their survival but to build their prosperity. 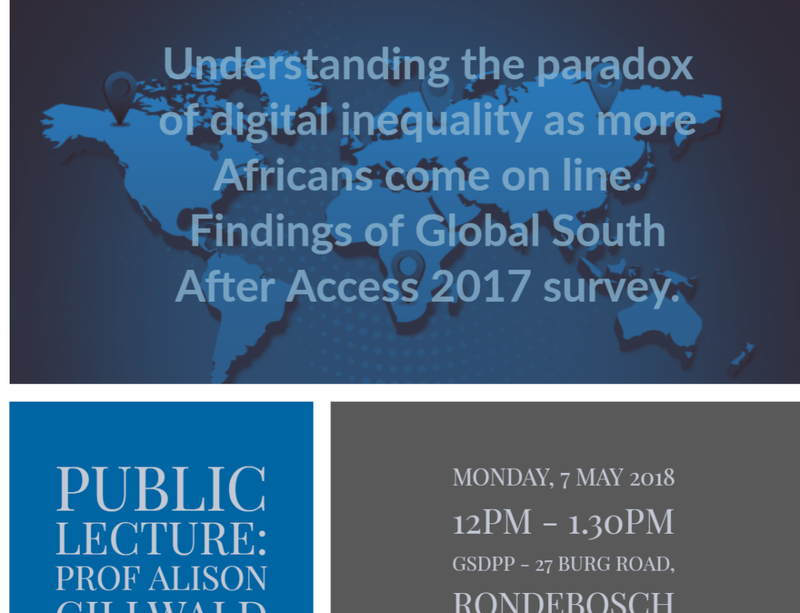 This digital inequality paradoxis arguably the biggest policy challenge facing developing countries in an increasingly globalised digital economy and society. As we move from basic voice services to broadband services with Over the Top applications offering low-cost voice and text substitution; micro-work platforms promising labour mobility and frictionless work; and digital platforms enabling financial inclusion, we need to understand what is working in the Global South and what is not. Particularly, we need to understand what is happening in Africa, which lags even other developing regions of the world. What are the reasons for this? What can be done to harness the opportunitiesoffered by Internet-enable services – and now, artificial intelligence and machine learning, robotics and big data analytics. And most importantly, as we are swept up in the hype of the so called ‘Fourth Industrial Revolution’ what needs to be done to limit the harms to citizens and particularly the most vulnerable who are most at risk as they come on line, often unaware or unable to exercise their rights. The After Access survey – long made possible through the support of the Canadian International Development Research Council (IRDC) and in 2018 by the Swedish International Development Agency (SIDA) – and conducted by DIRSI in LatAm, LIRNEasia and Research ICT Africa across 20 countries in the Global South during 2017 and 2018, 10 of them in Africa – provides some sobering insights into the policy outcomes of three decades of reform. While the liberalisation of markets and introduction of mobile technology revolutionised the lives of people in the Global South enabling millions of people to communicate by phone for the first time and to be financially included through mobile money – dramatically modernising economies and societies – it has been highly uneven. As we move from simple voice to higher value Internet services this inequity is compounded. By 2018 in many African countries the number of Internet users had not even met the roughly 25% Internet penetration believed to be the critical massrequired to enjoy the network effectsassociated with economic growth and development. While broadband network extension remains and issue in several countries, coverage is not the only factor determining connectivity and use of the Internet. In Lesotho, Rwanda and South Africa to name but a few African countries broadband coveragestands at over 95% and yet significant portions of the population remain unconnected. As Internet penetration tracks GNI per capita, South Africa is on the only country in sub Saharan African Africa in 2018 to have an Internet penetration rate above 50% – and the half of the population offlinedo not look very different from the more than 70% offline in the bigger African markets of Nigeria, Kenya, Ghana and Senegal or the 85 to 90% still offline in Rwanda, Mozambique, Tanzania – the former of which (Rwanda) also has the highest gender gap of 60% – only paralleled by the populous countries of Bangledesh and Pakistan in the wider Global South study. And this despite have some of the strongest supply side measures and investments on the continent and amongst the most progressive gender policies. The barriers to use for many people is therefore not that they are not covered by a signal, but that people do not have the resources to get online– the primary barrier being the cost of devices as well as the price of data. The After Access survey findings show that affordability of devicesand lack of awareness are the main barriers to Internet use in the countries surveyed. Of those who do use the Internet in Mozambique 76% indicated they cannot afford Internet enabled devices Internet despite having amongst the lowest data prices on the continent, while in Tanzania this figures is not much less at 64%, in Uganda, half the population and in Rwanda just less than half. Of those who do use the Internet 33% of South Africans stated that the price of data is unaffordable. Similarly, in Ghana and Nigeria, 43% and 40%, respectively, of those who do use the Internet do not know what the Internet is. While human developmentin Africa remains the biggest to dealing with digital inequity, alternative strategies to extend affordable access to communications are urgent. We simply cannot carry on doing things the way we have and expect the exponential changes we require. Without complementary stratgies, offline inequalities will simply be mirrored, indeed amplified on line. A multipronged strategy should include targeting the following areas. While connectivity on its own will not reduce economic inequality, connectivity is a preconditionfor participation in a modern economy and society. The fact that there is extensive coverage and yet a large percentage of the populations remains unconnected suggests challenges with the current commercial model of exclusive spectrum licensing and universal service fund strategies. To address this problem, complementary regulatory and delivery strategies will be required to enable different types of services to be offered by different kinds of operators. Reform spectrum policyshould be reviewed to enable more optimal co-existence of licensed and unlicensed spectrum that will optimise spectrum for diverse needs of countries, but which will prioritise affordable access to communications. Licensed spectrum required for the evolution of existing services needs to be released at a competitively-determined (efficient use) price to ensure the build out of capital-intensive networks benefitting from economies of scale and devices. With evidence that even cost-based GSM prices are not affordable to most Africans, spectrumshould be made available for secondary use. Nationally allocated spectrum not in use in remote areas must be made available through low cost or licence-exempt spectrum for communities, non-profit providers or micro-networks. Extending unlicensed spectrum to new frequency bands can spur investment and innovation, lead to the introduction of technologies that can complement licensed networks (e.g. via the hand-off from GSM to public Wi-Fi, which now also has backhaul application) and expand broadband access in low-cost, last-mile access. Enabling the deployment of dynamic spectrumis a critical aspect of spectrum management seeking to optimise the use of spectrum in the context of providing exclusive use required by operators for large sunk investments as well as the expanded licence-exempt spectrum that can reduce digital inequality by enabling access but also complementing high cost, private use. To effectively develop such alternatives, requires institutional arrangements that enable capacitated regulatorsto regulate effectively an increasing complex and adaptive globalised environment without state or industry capture and succumb to pressures from state to enforce retrogressive taxesthat undermine their digital futures or be lobbied by operators who act anti-competitively or place securing extractive rents above the national public policy objectives. This will also require data and information about what exists, in what form, how much its costs, its price at the point of sale, and what gaps exist in the reach of services from an economic, social and cultural perspective. An integrated and coordinated data-gathering procedure for the sector, and ICT across sectors, using audited administrative data, rigorous demand side dataand exploits availablebig datawith the underlying dataset available according to open dataaccess principles that guarantee anonymity and privacy. The data available shows that besides affordability, human development – particularly education and therefore income – are the primary determinants of access, intensity of use, and use of Internet for production and not only consumption. The development of relevant local content and applicationsin local languages, along with the enhancement of citizens’ digital literacy skills, are all important demand stimulants. This will require a cross-sectoral approachthat builds capacity not only digital literacy but advanced skills to support optimal use of software and local content development to meet local needs and in local languages. It will increasingly require skills development and realignment of skills to deal with increased automation of work, artificial intelligence, big data analysis and robotics. Need to create the cyberpolicy frameworks necessary to build a trust-based environment for e-commerce, e-government, digital finance and personal use. This requires introduction of legislation and guidelines in the areas of cybersecurity, privacy, protection of data and access to informa This needs to be developed in the context of wider state responsibilities that safeguards these rights and mitigates the risks and harmsassociated with the increasing value of data and the uneven power relations attached to it.Proactively protecting consumer and citizen interests and local online businesses will help in ensuring that the benefits of the digital economy do not only accrue to global platforms and the countries in which they are located. Africa economies need to formulate policies with the aim of removing barriers that prevent full engagement in the digital economy and harnessing the benefit. The policies mustenable participation of Africans in e-commerce, microwork to create jobs and boost Africa’s long-term competitiveness. This will require greater state coordination across sectors and between the public and private sector of policies and implementation that will align skills and improve citizens, state and companies’ readiness for digital technology moblisation. Africa needs to develop initiatives towards attaining harmonised regional strategiesto make smaller markets more attractive for investment and which takes into account generation, storage, processing, and transfer of data locally and across boundaries, e-government, taxation in the digital economy, and inclusive access and use. The policy should take into consideration and reflect the changes occurring in the production process and the increasing digitisation of production and consumption processes and international trade. Enabling cross border trade and reciprocal financial and taxation regimeswill be critical to realising the African Free Trade Agreement.